For a romantic, intimate evening out, immediately book a table at Soya & Pomodoro in Downtown Miami. Sitting in the alfresco-style trattoria feels like sitting in a side street of an Italian village. There are endless reasons to fall madly in love with this restaurant. Love is in the air with the delightful sounds of live music that fill the space, from Cuban rhythms to pure jazz, performed nightly Thursdays – Saturdays. Then there’s the eclectic, curious and completely charming décor: wrought-iron entrance, dim lighting, terrazzo floors, antique furniture, quirky knickknacks, and bohemian art throughout – complete with a laundry line hanging high above. As the great Italian screenwriter and film director, Federico Fellini once said, “Life is a combination of magic and pasta.” We couldn’t agree more! But finding bonafide pasta (or Italian food in general) that tastes as if Nonna herself made it isn’t always easy. And, we are just head over heels for Soya & Pomodoro’s artisanal cuisine! Since Magrelli and D’Oria are from Southern Italy, Naples and Puglia respectively, the specialties represent a mixture of the two regions. As the old Italian proverb goes, “Pan di sudore, miglior sapore.” (Translation: Bread that comes out of sweat, tastes better.) They’ve poured endless love and energy into Soya & Pomodoro, and completely stolen our heart! Start with the Antipasti Melanzane alla Parmigiana, which rivals any baked eggplant you’ve ever had. It’s a perfect balance of sweet and acidity. A heaping layer of baked, lightly breaded eggplant is topped with gooey mozzarella and parmesan cheeses with plenty of savory tomato sauce. Sop it all up with crunchy Italian bread, while enjoying a glass of bold Montepulciano wine. This is a love fest on the palate! 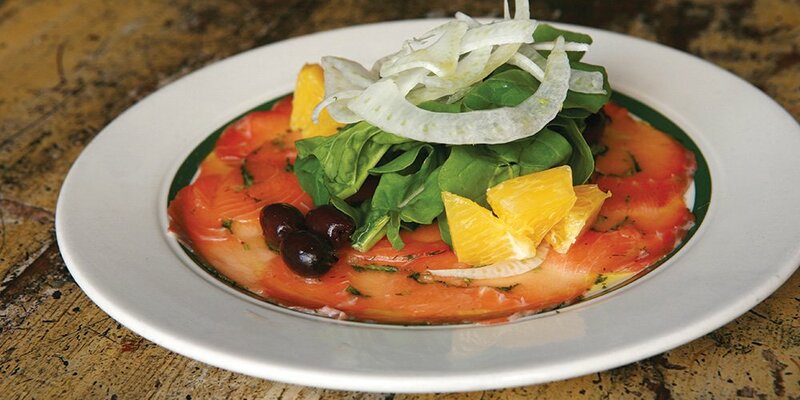 Before you order a second plate of that magnificence, try our next recommendation - Carpaccio Di Tonno. A light and flavorful dish, paper-thin slices of fresh tuna meet hints of peppery arugula, crisp onions, sweet-tasting fennel, beautiful kalamata olives, and juicy cuts of orange. Pair this fusion of lovely flavors with an aromatic Sauvignon Blanc! Speaking of wine, Soya & Pomodoro’s menu offers varietals from across Italy’s top regions: Veneto, Abruzzo, Campania, Puglia, Trentino, Sardegna, Sicily, Piedmont, and of course – the revered Tuscany. All bottles of wine are 50% off on Wednesday nights. We’re feeling the love! Our hearts skipped a beat when the plate of Fazzoletti di Formaggio e Pera landed at our table. This is quite an outstanding and unexpected surprise! Handkerchief-shaped pasta is stuffed with tender pear (yes, pear) and velvety cheese, sautéed with perfectly cooked baby shrimp, and covered in an exquisite creamy ricotta sauce. Pure texture. The Pappardelle con Gamberi e Pistacchio is flawless. Mouth-watering wide fettuccine is plated with plenty of shrimp in a generous pistachio pesto sauce with hearty roasted tomatoes. It’s a well-seasoned and delicate array of sheer earthy, herbaceous, intense, and tangy goodness. Mangia! Now feast on the succulent, melt-in-your-mouth Filetto alla Provola. A tender, pan-seared Filet Mignon Medallion is served with expertly sautéed spinach sitting on a fluffy bed of buttery mashed potatoes with smoked mozzarella. Accompany every morsel of this comfort food with sips of rich Sangiovese wine. Such decadence deserves a touch of sweetness. The dense chocolate and almond flourless torte, Torta Caprese is a classic Italian cake. With an expresso, this is a delizioso finish. Or, cap your dining experience with a time-honored digestivo - homemade, chilled Limoncello. 120 NE 1st Street, Miami, FL, 33131.